Woodworks by John | Thoughts and decisions as I create my work. Journey with me through the fascinating world of woodworking. In almost every aspect of my life, it’s all about the challenge and figuring out how to overcome it. Makes no difference, it can be a woodworking project, ultra-marathon mountain race, personal goal or whatever — rising to the challenge is always satisfactory! This box was a challenge put to me by the person that started it by offering their well used piano as a source of materials. 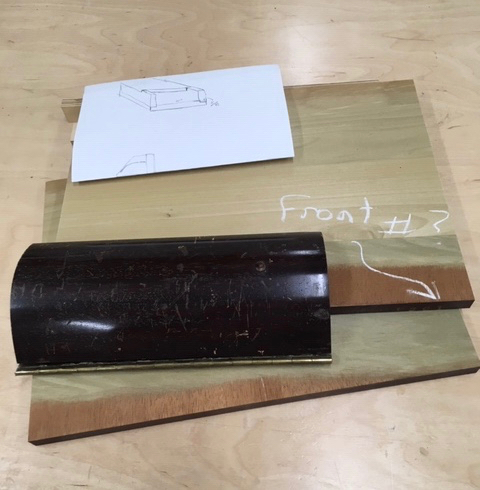 Things started out fairly easy as you can read about in this BLOG on the first project made from the materials. When I shared that blog with her it must have set her wheels in motion because a few days after that I was contacted with “the challenge”! For background, every member of her family are serious musicians and they’ve probably all used this piano sometime in their lives. She was wondering if a box could be made from it to store sheet music. If you recall from the first blog, I was hoping to find boards of solid mahogany or walnut but discovered that it was primarily veneer over Poplar and in some areas Chestnut. I salvaged what I could and ran it through my planer to remove the veneer. When we met, she used the words “funky box” so I think this will fit that genre! Sheet music is larger than the standard 8 1/2″ x 11″ paper. She brought over some of that and our design collaboration began. Lots of ideas were thrown out but the size of the paper determined the overall size of the box which is 4″ tall x 11 1/2″ wide and 14 1/2″ long. One piece has the numbers 1301 stamped so I wanted to keep that at the front of the box as proof. I discovered that the formed key covering piece seems to have been made from one piece of Poplar that was milled and then veneered. This was cleaned slightly but all of the original patina left intact. The first step was to glue up some panels to make the top and bottom of the box. For that I use Gorilla glue and my old school panel clamps. The sides and back of the box were made from the Chestnut which has a nice grain pattern. To keep with the “funky box” genre, they were finger-jointed and the front pieces have part of a tongue that remained after trimming them. 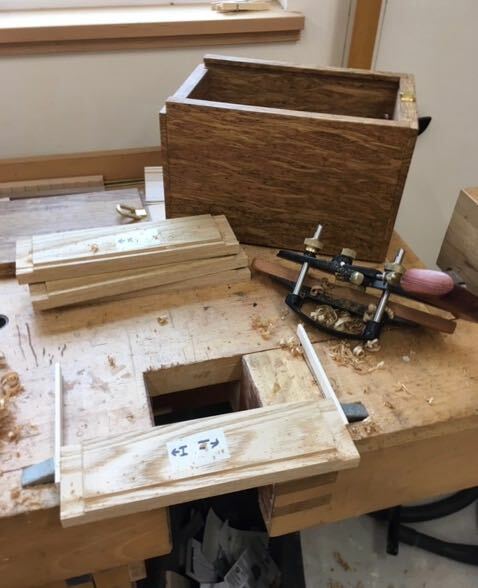 Finger joints are a very traditional way to join boxes together and the jig I made for the sliding table on my SawStop make them quite easy. Since I also salvaged some of the Ebony keys from the piano they were turned into pegs to join the rabbeted top and bottom to the sides. Assembly was done with Old Brown Glue, my favorite for dovetails and finger joints. To keep it all authentic, part of the piano hinge and screws that once graced the piano itself was used for the lid. The handles are some latches that probably held the top or bottom panel in place. To secure those to the lid I used the piece of hardware I found at the end of each key where the piano wire was attached to. After wet sanding in a few coats of Osmo PolyX oil the box was waxed and ready for delivery. So there it is, 10-11 hours of work and a bit of head scratching to see how it would all come together but the challenge was met. As of now, the box hasn’t been delivered yet so don’t know what my clients reaction will be — I like it! Wow, just turned the calendar to April and wondering what happened to March? My wife really dislikes the expression “f *#*t in a whirlwind” but that’s how I feel the month went! Many things going on between the house, woodwork, and becoming pre-marital counselors for our church. One good frame commission came to me from Devon Kearny who needed 3; 11″ x 14″ frames. She’s a local artist, friend, and instructor at the Scottsdale Artist School. These were about 3″ wide and made from the 1 1 /8″ Basswood I like to use from Peterman Lumber. Finish was satin black over planed wood then rubbed back a bit to replicate age and give that hand crafted look you won’t get from a mass produced frame. Basic process used on all custom frames to create these for her, always enjoy the progression from rough material to finished frame! Also had things to address around the house. One that didn’t get accomplished in March was to rebuild our berms. We use flood irrigation and need to raise the height of a few berms in the back yard — well, there’s always April for that manual labor! Basically there are some areas that have compacted so the water doesn’t quite go where we want. A couple loads of dirt, wheel barrow, shovel, and tamper should take care of that. Something that took more time than anticipated was putting a powered exhaust fan in the attic. Our house has been added on to a number of times since it’s original build in 1951. One of the additions is our master bedroom and it’s much warmer during the summer than the rest of the house. After cutting an access hole to get to that area in the garage, I discovered that the original roof had been left under the new addition. This would seem to prevent good air flow in the attic creating a hot spot right above our bedroom. First thing was to go remove as much of the old roof (shingles, tar paper, and sheeting) as possible, space is limited since the roof is a very low pitch. 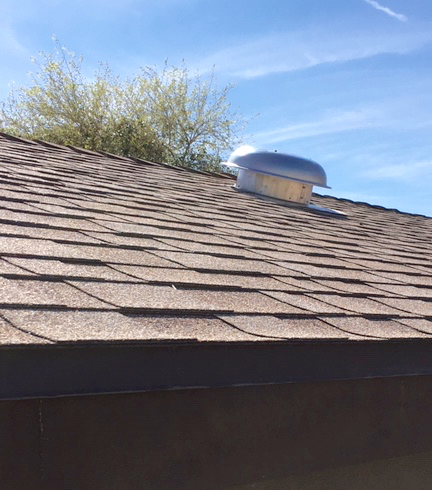 Once done, I was able to make my way to the backside of the house to locate and install a thermostatically controlled, electric exhaust fan through the roof. Here’s a video of it taken from inside the attic! Purchased the fan from JetFansUSA and must admit I was really impressed with the reviews and customer service from Jeff who I contacted several times via email. Something that’s taken a good chunk of time this this month is my quest to become more proficient at water gilding gold leaf. The process is quite exacting and time consuming. Begins with making rabbit skin glue, then gesso, then bole (clay) before the gilding process can even begin. Then picking up your precious gold leaf with a gilders tip to place correctly on the frame — pictures speak volumes! Carved & gilded corner, too much rub! Knowing that this is a skill that will take time to become proficient at is okay — although frustrating. 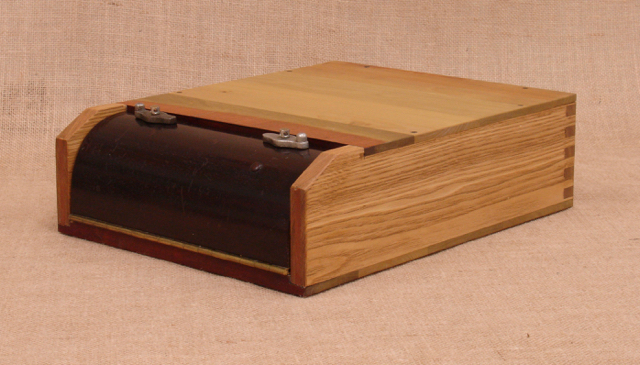 In the works is a box made from the wood salvaged from the Chickering & Sons piano. It’s coming along nicely and the client had input on the design of it. That’ll be my next blog! It’s a basic hand cut, dovetailed box which could be used for pencils, remotes, keys, or decorative item. I like the grain patterns of the wood and used an Ebony key for the lid handle. Dimensions are 3″ high by 4 3/8″ wide and 9 1/4″ long. The inside is lined with a red velveteen material and the finish is hand rubbed PolyX oil. This box will be added to my inventory at the Store at Mesa Art Center. I suppose this would fit the current movement of up cycled, recycled, re-purposed stuff but to me it’s just using and showing the beauty of wood regardless of where it came from! Construction details are pretty straight forward and all hand tool with the exception of cutting the board to width and length which I do on the table saw. It’s important to me that the grain continues around the box so the box is cut from one piece of material. That means only one corner will not have a perfect grain match. I’m making two of these boxes but you can see how they are marked on the inside to ensure proper alignment. The first step is to cut a slight rabbet at the end of the long sides. This is referred to as the Stanley 140 trick and one I use in any dovetailed construction. The purpose is to give a tight inside corner. 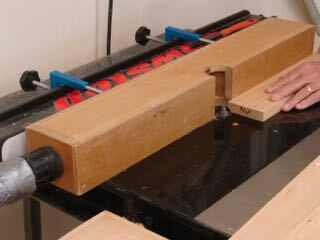 If you make it deep enough it will also conceal the groove needed to insert the bottom of the box or drawer. 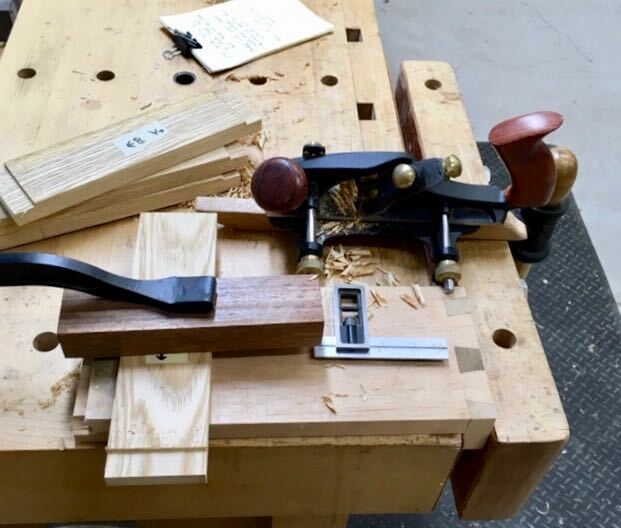 Not having a set of skewed block planes means I use a Veritas skewed rabbet plane which does the job nicely and, unlike the Stanley 140 has a depth stop. The next step is cutting the groove to insert the bottom. In this case a piece of 1/4″ Baltic Birch plywood. Plow plane is used for that process. Cutting the dovetails is a process I’ve written about many times so won’t bore you with that again. Just a side note, as a member of the co-op at the Mesa Art Center I’m required to give demonstrations at the store. The first box was demonstrated previously but I’m scheduled to demonstrate again today from 2-6:00 pm. Today being March 16, 2019 so if you’re out and about stop by and see me! I always have mixed feelings at the completion of a project. Seeing what I imagined in my mind progress from pencil and paper to 3D completion is always great but sad in its own way. Maybe you’ve heard of those postpartum blues, heck; I used to experience those myself after months of preparing for an ultra-race. Finishing always gave me mixed emotions; glad to have completed the challenge but sad that the training and preparation is phase is over. The last blog detailed the main construction details and forming of the parts. All that remained was fitting the molding for the frieze. Seemed straight forward enough but it was important that the vine matched as it returned around the corner. After making the miter cut it was refined and trimmed using a block plane and miter shooting board. It took a bit of finagling to get the vine to match as it returned, one side needed to be cut from the remaining piece. The purpose of the arrow on the backside is to indicate which side goes up. 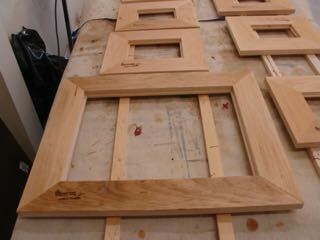 These pieces will be oil gilded and glued in place after all of the finish work is complete. After some final planing it was ready for the red burnisher/sealer undercoat. The frieze area was taped off, wanted to make sure no paint got in that space, the molding will be applied with glue and a few pins. The final finish is Japan Drop Black by Ronan. Other than glue-up, the finishing step is the one that causes me the most stress. Using paints is temperamental, so many variables such as the temperature in the shop, reaction to the undercoat, and thickness of the application. I’ve developed a way to burnish the Japan Black to give it a low luster which includes wiping back to expose some of the base coat. The goal here is to replicate normal wear and tear the frame would normally go through. You’ll notice that Julian’s painting has a bit of red in it and my goal was for the frame to also accent that in an understated way. Here are some images so you can decide for yourself if I succeeded! The oil gilded frieze was sealed with shellac and then toned with a casein wash. The final layer on the entire frame is Liberon Black Bison wax. My mind set during this process is to add unexpected nuances to the frame finish that are discovered over time. I’m not sure if all artists and woodworkers get as excited about the progress of their projects as I do but my guess is that they do! It’s just plain exciting to watch something take three dimensional shape after drawing it and “conjuring” it up in your mind. That’s where I am on the Tabernacle frame # 157. After some time, things are really starting to come together as this picture shows. The final top piece won’t be installed until later, I need to miter and fit the embossed piece of molding first. It’ll be a challenge matching up the pattern so stay tuned for that one! Pin nailers are great tools but as particular as I am, find that the hole they make still needs to be filled prior to finishing. They are valuable though to secure the piece in place prior to clamping. 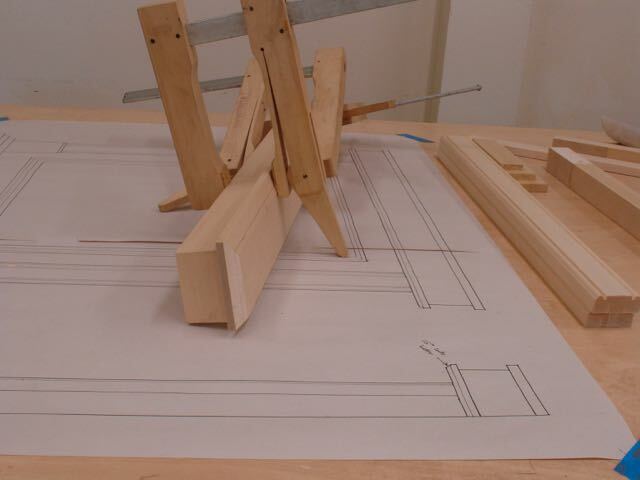 Trying to glue and clamp the piece like the column is crazy — they just move all over! My technique is to apply the glue, shoot in a couple of pins, and then clamp it and watch the glue ooze out of the joint so I know I’m getting a good bond. 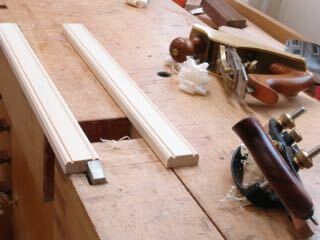 For the stepped molding it was rabbeted so that is used to register the location so no clamps needed. For the plinth blocks though I found it necessary to pin it in place before clamping. Those blocks were chamfered at the tops with a block plane prior to assembly. Wanting to keep the chamfer on those plinth blocks as angular as possible I decided using a block plane was the best bet. Only about 1/8″ and an eyeballed 45°. The columns needed to be sanded to smooth a little bit of tear out left by the beading cutter, tadpole sanders and some 220 grit paper took care of that little detail. The top of the frame will have an embossed molding, this is what it looks like. The trick will be figuring out how to match the pattern as it miters back towards the sides of the top. I’ve ripped off the rounded edges as it seemed too tall. Here’s the bottom/top piece with a chamfer cut which is designed to draw your eye up. This piece was pre-drilled and is now attached with glue and screws to the top of the tabernacle frame. Once that embossed molding is fitted I can install the top piece. The molding will be oil gilded over a red base and then antiqued to add that much needed patina and age — yep, I already have some thoughts on how to go about that one as well. That’s it for this update, I’m starting to understand that brushing on the red burnisher base coat and then the Japan black will be yet another challenge since the pieces are going every which way. There’s a lot of ins and outs and pieces going in opposite directions. The client I recently completed the Tabernacle frame for, Christine Vallieres; contacted me and needs a number of frames for an upcoming show she has in March. She’s a very good client and her show will be held at The Sagrado in Phoenix. For this job there are 7 different frames so it’s important for me to organize the work flow to stay efficient. 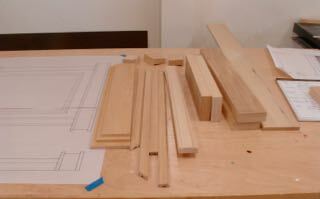 One starts out with 1 – 1/16″ Basswood, the others are smaller and for panels so were made from 4/4 Basswood. All are created using a combination of tablesaw, router, and hand work. Shown above are the profiles for the smaller (4×6 and 5×7) frames which are what I call The Christine Profile. These are 3 1/4″ in width. I’ve been contacted by several other folks who make picture frames asking about my process. I buy my Basswood in S2S with one fairly good edge. 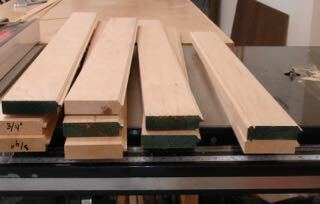 After cutting to workable length (depends on frame sizes) the first step is hand planing a perfect edge to guide against the tablesaw rip fence set to the required width. After cutting, that edge is refined with the hand plane. The larger frame features a beveled profile so these were cut on the tablesaw first and then refined with a smooth plane. Fence for dust control with router edge work. One of the frames had the outer edge formed by using my plow plane with a beading cutter — that I like! Others required the router which; although it’s essential, isn’t one of my favorite activities. Why — dust and noise! To combat the dust this is a fence I made years ago that captures about 90% it. That works fine for profiling an edge but there are also coves cut into the face of the molding. All of the dust goes down the bottom and everywhere else. There are various after market dust buckets you can buy but I really haven’t researched them fully, I did know that if you enclose the entire router there’s the danger of heat build-up and possible tool damage. My solution was an $8.00 rubbermaid container and a couple of bucks worth of plumbing fittings — captures about 75% of the dust I’d guess so a definite improvement. 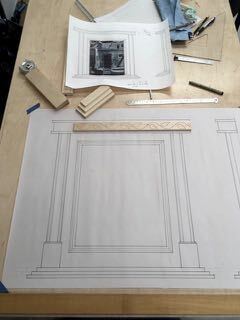 After all of the molding is profiled it’s time to cut them to length. 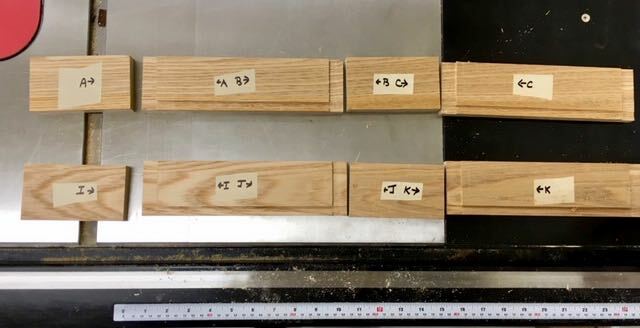 There are two critical requirements for a good frame, first the miter has to be exactly 45° and the lengths of opposing pieces have to be exactly the same. 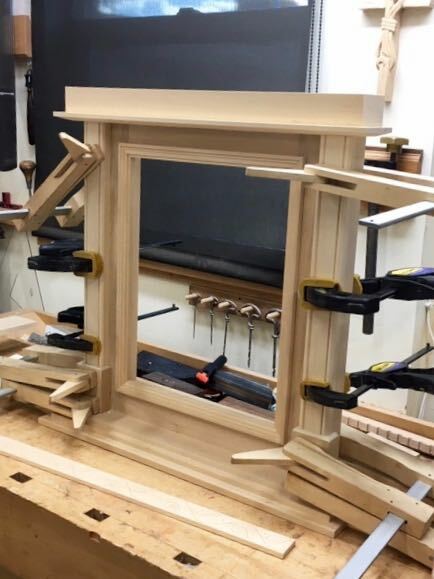 Since these frames are so small, I needed to modify the miter jig and add a new stop to it. 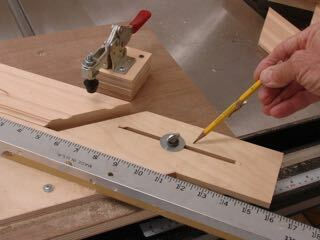 After cutting a slot in a piece of plywood a threaded insert was put into the jig. The stop is slid where needed and then tightened with a thumb screw. I’ve been asked about making this jig, here’s a LINK to the blogpost of the first one I made. All of the frames have been assembled (#20 biscuit, glue, clamped over-night), signed and numbered, and the backs have been sealed with shellac. Probably an extra step but worth it in my opinion. Finishing is next although it’s been kind of cold and windy for Phoenix anyway so my “whole world” spray booth conditions aren’t optimum!